Readying myself for battle I donned my armour. A full arsenal of running apparel, including shirts, jackets, hats, gloves, and long underwear — each in multiple quantities. 27 articles of clothing in all. Enough to make even the most sainted nun feel secure in a night of strip poker against the devil himself. I would do laps around the neighbourhood. Stepping into the warmth of heart and home every 15-30 minutes. A hot coffee, Gatorade, water, and D awaiting me on each return. 5.22 kilometres on my first outing. A quick check-in and back out for another 5.91 kilometres. At this point I am less than 19 kilometres away from finishing my appointed 30 km run. And less than 3 km from completing 100 km for the week. 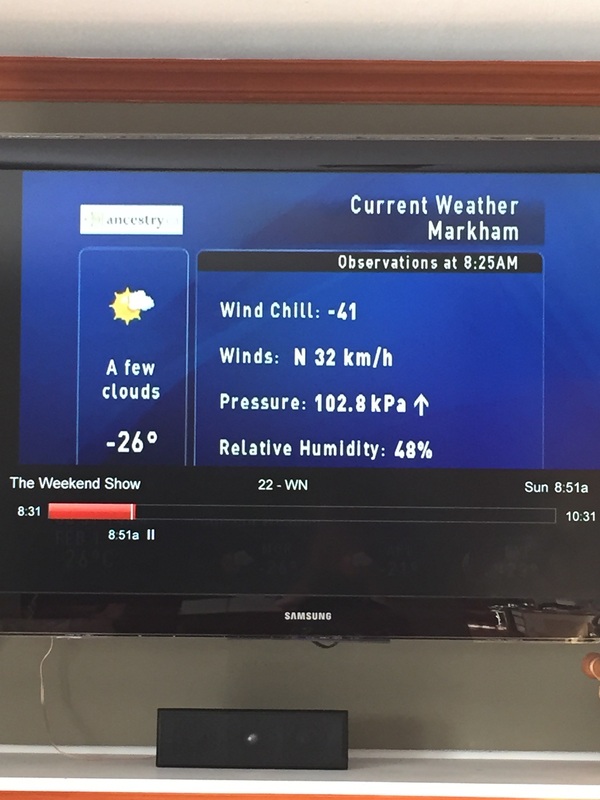 At -41C with the windchill, the conditions are perilously formidable. My form is bulky and unwieldy, weighted down as it is by the heft of so many layers of clothing. My vision occluded by the frost on my lashes that forms within minutes of exposure. And my breathing laboured through a makeshift face mask. I look at D and before I utter a word, he already knows what I’m about to say. This is my final outing. I will complete my 100 kilometres. But I cede the 30 kilometre goal. Mother Nature wins this round. She is too strong. And I, not strong enough. However I’d like to think myself as noble in defeat. Savvy in surrender. I did run more than 14 kilometres in by far the coldest most extreme conditions I have ever faced. And I’d like to think that Mother Nature herself would capitulate on this icy morning even a modicum of respect for her vanquished foe. A hint of a smile and a tip of her floral-topped chapeau in my direction. Coming in out of the cold I enjoy a hero’s welcome from D. He props a hot bowl of soup in front of me and any wounds to my ego are immediately salved. Today I wasn’t strong enough. But tomorrow is another day. Sounds like D made it all worth while. Im still steeling my mind against this cold and will head out soon for my battle. The war is not over! Go get’em Shawn! But be safe. Post a blog so we know you’re well? My only other question or comment is “WHY”? Fitness? No. You could juggle the schedule for fitness. Upcoming race? Not that I know of that is so close that this workout is critical. Prepping for race condition? Doubt it. Have you ever run a race in this weather? Unless you have signed up for one of the Antartica Marathons, then the answer is no. (Oddly, I have run multiple races in -30F wind chill…but even I don’t train for that kind of weather). You are risking hypothermia and frostbite. A slip and fall on the ice in this weather can be life threatening, and the likelihood of being found before cold related injury would be low. So, I guess I still don’t know the answer. Could you enlighten me? Sometimes even the worst of conditions won’t stop a man from taking part in his love. Yes the elements were extreme but he gave it a shot and learned when enough was enough. It is during miserable runs that you truly learn what you are capable of. Only running when it is perfect outside won’t show where his limits are. I think it’s awesome he went for it! Thanks Joey! Very well said. And very much appreciated. I look forward to reading your best seller! Will there be a chapter on running in extreme weather? Raymond thank you for your concern. The simple response to your question/comment is because I had to try. To give myself an honest shot and to see what I could or could not do. I think tomorrow is due to be colder… At least for us in Philly! I think we’ve got another cold one in store for tomorrow too! Hopefully not as bad as today though. Sounds like you made a smart choice today. There will be lots of other days for 30k runs! 10k was definitely enough for me today. I didn’t have too much trouble on my first 5k loop at the race, but the second time around was the first time every in my running that my face got colder as I went rather than warmer, Just was too much wind out there. Thank you Kristi! And congratulations to you and your family for RACING in today’s conditions! It was my 2nd outing that did me in today too. Good choice mate. At least you got a taste of it though!